LAS VEGAS – There are times when the results of preseason games shouldn't really be trusted as far as you can throw them. But Las Vegas Lights FC putting a 5-1 result on a Toronto FC lineup that included Alex Bono, Laurent Ciman and Jay Chapman in its starting lineup? We might have to make an exception. Sure, Toronto could have been treating this as a training exercise, especially with another lineup set to go up against Vissel Kobe later on Saturday at Orange County SC's Championship Soccer Stadium. Las Vegas could have been treating this game like its own USL Cup. 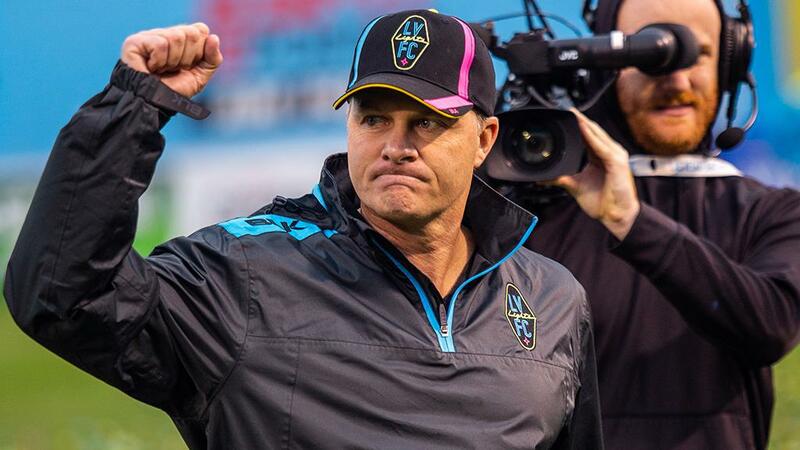 But there's a head-turning aspect to this result that should have other USL Championship teams paying attention: The Eric Wynalda era has arrived in Sin City, and if Saturday night is any indication, it's not here to mess around. Whether it was a pair of goals by former Toronto FC II forward Edwin Rivas – maybe there was a little extra motivation there, you think? – or Irvin Parra finding the net for the first time in his new colors, Las Vegas ran up the score on a club that is getting set to play in the Concacaf Champions League in two-and-a-half weeks. For the more than 5,000 fans on hand at Cashman Field, the expectations could easily be sky-high following an afternoon that washed away the memory of a first season that had some tremendous highs, but too many lows for the USL Cup Playoffs to be a realistic proposition. Now, though, they have Wynalda, a head coach that will wring out every ounce from the players he has at his disposal. They could easily form a unit that identifies as misfits within the North American soccer system – a badge their coach would likely wear with honor – and given the paths that have led some of them to Vegas there would be little to question about the veracity of their claim. It could be easy for some of those who’ve arrived in the entertainment capital of the world to view it as their own last chance saloon to make a major impact in their soccer careers. For the players, there’s the chance to not only achieve something special this year but also provide a platform for Lights FC that could result in sustained success in the future. For Wynalda, there’s the freedom to lead a club in the way he has long believed it should be run, offering chances for talent to rise to higher levels while also burnishing his credentials as someone who needs to be taken more seriously as a talent evaluator and coach than some are prepared to credit him. For Las Vegas’ fans, there’s the chance that this side is one that can stand alongside the NHL’s Golden Knights – who rode their ‘Golden Misfits’ mentality to 2018 Stanley Cup Final – as a main attraction in the city. With Cashman Field’s conversion to a soccer-specific stadium about to get underway, Lights FC has its chance to become an institution in what’s about to be a busy sports scene. So, yeah, it was only one preseason result. It’s fine if you want to discount it. But two months from now after Las Vegas has put a similar result on one of its USL Championship opponents in the first month of the regular season, the reality that Lights FC is here and ready to take on all-comers could be in far sharper focus.